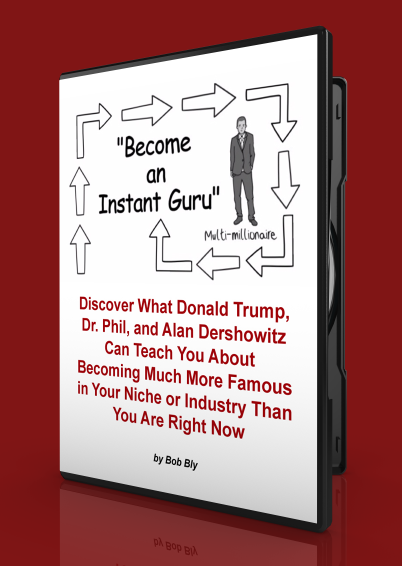 Discover What Donald Trump, Dr. Phil, Peter Drucker, and Alan Dershowitz Can Teach You About Becoming Much More Famous in Your Niche or Industry Than You Are Right Now. More importantly, find out how that will make more money for your small business. Bob Bly, author of 80+ books and the man McGraw-Hill calls "America's top copywriter," reveals how you can become an "instant guru" or expert in your own field or industry. I have nearly every book, CD and seminar Bob has produced over the years (including this one) because each one made me more successful. Return on investment? Easily 100 times the incredibly low prices he charges. Establish yourself as the guru or "go-to" guy (or gal) in your field. Have potential customers and clients come to you ... rather than you going to them. Generate five times as many leads as you could ever hope to handle - and get booked up to 3 to 6 months in advance. Double, triple, even quadruple your income - and earn as much as a million dollars a year or more. Gain the admiration, respect, and (yes) even awe of others in your market and community. There's one thing you may or may not know about the experts I mentioned. They are not the most expert ... not the most successful. Alan Dershowitz does NOT have the best record of any trial attorney in the United States. Far from it. Peter Drucker is NOT the best corporate manager in the world ... in fact, he has never been CEO of a major Fortune 500 firm! Dr. Phil is NOT a licensed or practicing psychologist since 2006. The reason that these people are gurus ... famous in their fields, sought after by millions ... is that most of them are the best at promoting themselves as experts in what they do ... not in actually doing it. They all, to one degree or another, used basically the same fundamental formula ... I call it the "Become an Instant Guru System" ... that Bob Bly teaches in his program. Just follow the 10 simple steps he outlines, and within 90 days, people in your market will begin to know your name ... view you as an authority in your field ... and start asking you, in record numbers, to take them on as customers or clients. Use the button below to read more and order.